Taken at Kume-island Black Water Dive® on from 28 to 31th july 2016. The larvae had many appeared at that week, but next week was very less. Depth of appearance of larvae was mainly from 8m to until surface. Identification of Larvae of Pomacanthidae is very difficult because many species of the Meristic Characters are overlapping. Color of larvae are very similar both across species and genera. Of this time Identification was base on the color of advanced larvae. Most of the body is silver, dorsal is reddish brown. 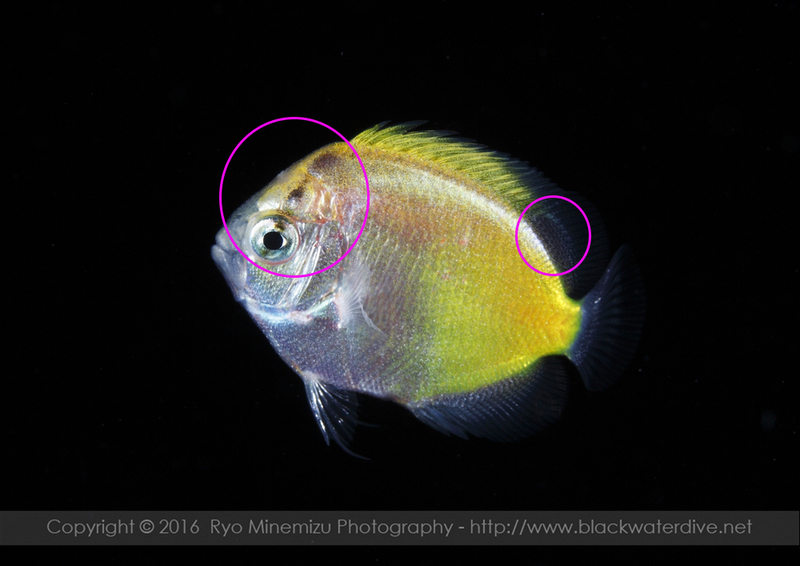 Body yellowish, from nape to eye has dark pigment line and white framed eyespot on dorsal fin.